Grass of Parnassus is one of our most distinctive and beautiful wildflowers, and where it does occur this lovely wildflower nearly always forms photogenic groups. A hairless perennial plant, 15 to 30cm tall, the most distinctive feature of Grass of Parnassus is its flower. Each unbranching stem bears just a single flower 15 to 20mm across with five white petals, strongly veined in translucent grey-green lines, and five sepals. The flowers are hermaphrodite (having both male and female reproductive parts), and in their centres five groups of yellow stamens alternate with five anthers. At the centre of the flower is a four-lobed stigma. Seeds of Parnassia palustris are also distinctive. An oval four-valved fruit capsule contains numerous tiny oblong seeds. More common in the north of Britain and Ireland, and hardly ever found in the far south, Grass of Parnassus occurs in most other countries of northern and central Europe. We have seen these wildflowers from Sweden in the north right down to Slovenia and Italy. The geographical range of Parnassus palustris extends eastwards into Asia, and this species is also found in many parts of North America. Parnassia palustris grows on damp soils and is tolerant of both acid and calcareous substrates although showing a preference for alkaline areas. 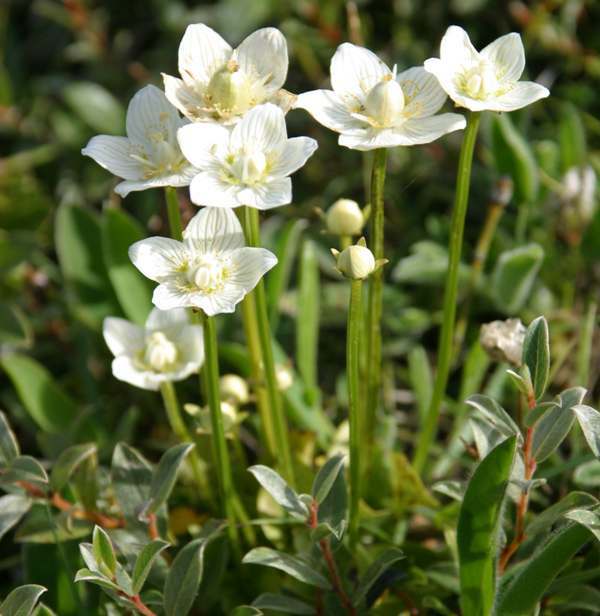 In Wales, for example, one of the best places for seeing this wildflower is Newborough Warren National Nature Reserve on Anglesey, which has fine colonies of Grass of Parnassus in the calcareous dune slacks. 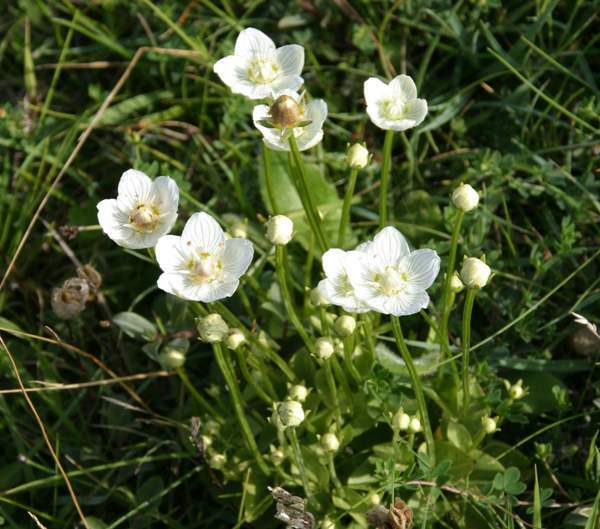 In Britain the first flowers usually appear in June, and Grass of Parnassus continues blooming until late September. 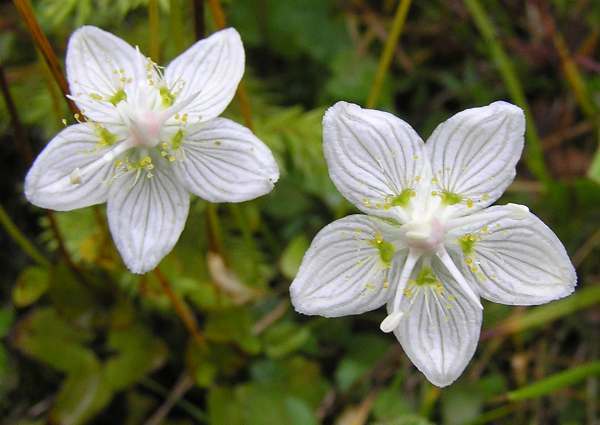 Popular as a bog-garden flower, Grass of Parnassus is not noted as an edible plant, although in the past its reputed medicinal properties made it part of the herbalist's treasure chest, particularly (as so many plants were) as a styptic for treating wounds. The plants were dried and ground into a powder which then could be stored until required. Grass of Parnassus is the county wildflower of Cumbria and of Sutherland. The generic name Parnassia mean from Parnassus; which is a mountain in Greece, and it seems that cattle grazing on the mountain were assumed to be enjoying these plants just as much as if they were some kind of grass (which they are not, of course) - hence, some suggest, the term Grass became part of the common name. Another view is that as the lines on the petals resemble blades of grass they could be the origin of the common name. The specific epithet palustris comes from Latin and its meaning is in no way matter of conjecture; it means 'loving marshes' - a reference to the kind of habitat which Grass of Parnassus favours. The Parnassia palustris plants shown on this page were photographed at Newborough Warren National Nature Reserve during July.